Jakarta, 28th March 2016 – With climate change accelerating and the planet's health in rapid decline, today, the world's population are beginning to prevent environmental destruction in many different ways, one being Earth Hour; a worldwide event where people switch off their lights and electricity for one hour. As the managing company of over 110 properties across Indonesia and South East Asia, Archipelago International proudly supported Earth Hour to help fight climate change. Through several of its hotels, Archipelago International joined the switch-off event to increase guests' awareness of the importance of energy conservation. Hotel NEO Penang in Malaysia joined the switch-off event for the first time by turning off their façade, signage and non-essential lighting, as well as dimming the lights in public areas, restaurants, and exterior spaces. More than 20 of the hotel's guests participated in a selfie contest held by the Hotel, and each received a special 50% discount on the Art & Soul Café's a la carte menu during Earth Hour. They also received a complimentary Starry Fizz mocktail after posting their picture to Facebook and Instagram with the hashtag #NEOEARTHHOUR. Hotel NEO Dipatiukur also followed a contemporary approach to increase guest awareness by holding a similar Instagram Photo Challenge. Guests who posted their best photos with the hashtags #neohotel #neohoteldipatiukur #earthhourchallenge and #earthhourNEOHotelDipatiukur got the chance to win a night's stay and F&B vouchers. The Hotel will announce the winners at the end of March 2016. In Aston Semarang, staffs were handing out 1000 candles in Kota Lama at 3PM to inform the surrounding community about Earth Hour. In honor of WWF, the founding organization of the Earth Hour movement, one of the staff wore a panda costume while the Hotel handed out the candles. Aston Semarang’s Jade Café & Resto also held a poolside Candlelight Dinner from 6PM with dozens of floating candles forming the Earth Hour’s “60 ” logo. Meanwhile, Aston Marina provided a complimentary light meal and live music at the hotel’s lobby, and Aston Kupang gave 20% discount on the F&B menus during Earth Hour. 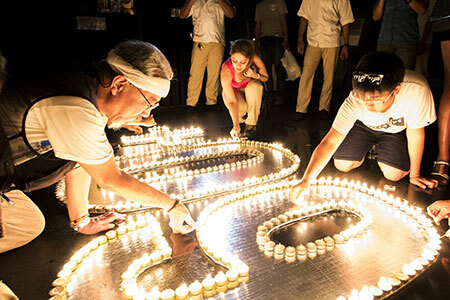 As a joint effort between the Grand Sudirman business complex and Aston Balikpapan, 190 candles were lit to form the “60 ” logo during the one-hour switch off event. By partaking in Earth Hour, the hotel aimed to save 10,000 watts of electricity to reduce its CO2 emissions. Several other Hotels also joined in on the one hour switch-off including Grand Aston Yogyakarta, Aston Kuta, Aston Makassar, Aston Priority Simatupang, and Harper Mangkubumi. Archipelago International is Indonesia's largest hotel management chain with a portfolio of over 112 hotels and 15,000 rooms. It also continues to have the fastest growing brands with over 100 properties in the pipeline across Indonesia, the Philippines, and Malaysia. Their 7 core brands include favehotel, NEO, Quest, Harper, Aston, Alana and Kamuela, ranging from ultra-luxurious villas to select-service, economy-class hotels to serviced-apartment residences..